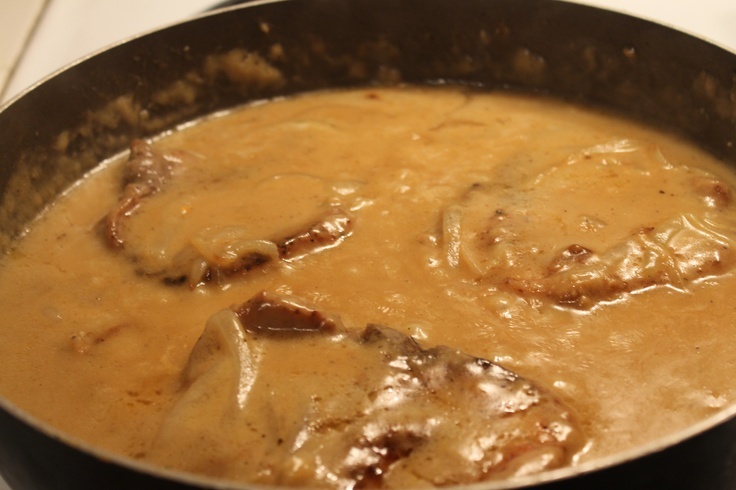 This smothered pork chops recipe is packed with all the flavor you have grown to love as well as some mouthwatering onion gravy. If i must say so myself, this is one of those recipe that you want find at any of the restaurants you normal eat at, so you'll have to cook this one at home in your kitchen. I have always thought that pork chops make for a delicious meal. This is definitely a soul food and southern cooking favorite. If you like pork chops, onions, and gravy you have to try out this recipe. Make this recipe today for your family because they are absolutely going to love this meal. "Your recipe for smothered chops is THE BEST I've ever made in my life!! The seasoning blend is pure perfection. The aroma of it can be smelled throughout my kitchen BEFORE I even start cooking the chops." As always the key to great cooking is to be prepared and to use quality ingredients. This recipe calls for 4 pork chops because that's about what you can fit into a standard frying pan. I recommend you double the recipe because smothered pork chops are so delicious that you will definitely want to eat leftovers. Add two cups water to the onion gravy and stir. Bring to a boil over medium high heat. Return pork chops to skillet, reduce heat to simmer, cover and cook for about 1 hour. The meat is done when it's tender. Add additional season to taste if necessary. Serve the smothered pork chops over cooked rice with your favorite vegetable side dish and cornbread. Leave us a comment below and then let all your friends and family know about this recipe if you enjoyed your meal.